My birthday was last Wednesday, which serendipitously coincided with an invite from Modern Shanghai in Glorietta. I initially thought to decline the invite to spend the day with my family. But as we went along, I saw the guest list was slowly being filled with some of my dearest blogger friends, so I realized this would be a great opportunity to celebrate my birthday with them (Without having to spend hehe)! Little did I know that my friends had a little bacon themed surprise from me, with a little.. no A LOT of help from one of the hottest name in the pastry scene today! 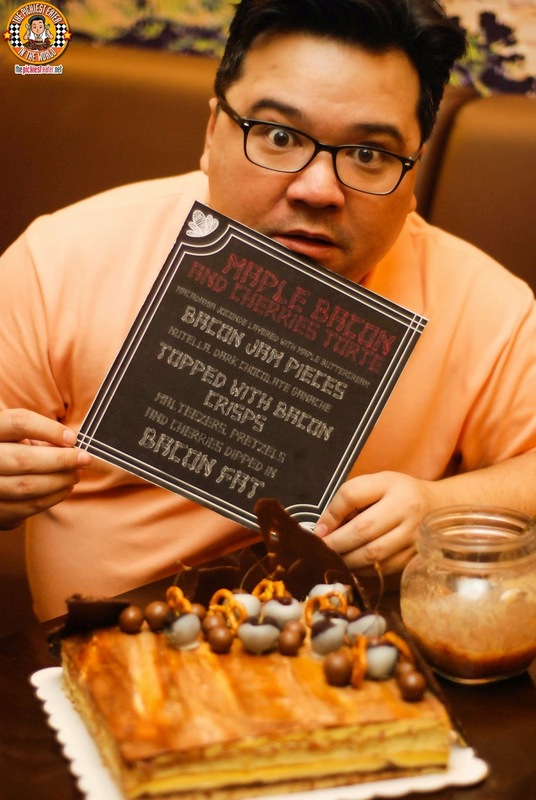 My friends, spearheaded by my buddy Hefty Foodie, approached Pastry Chef extraordinaire, Miko Aspiras, with an idea of coming up with a Bacon themed cake. 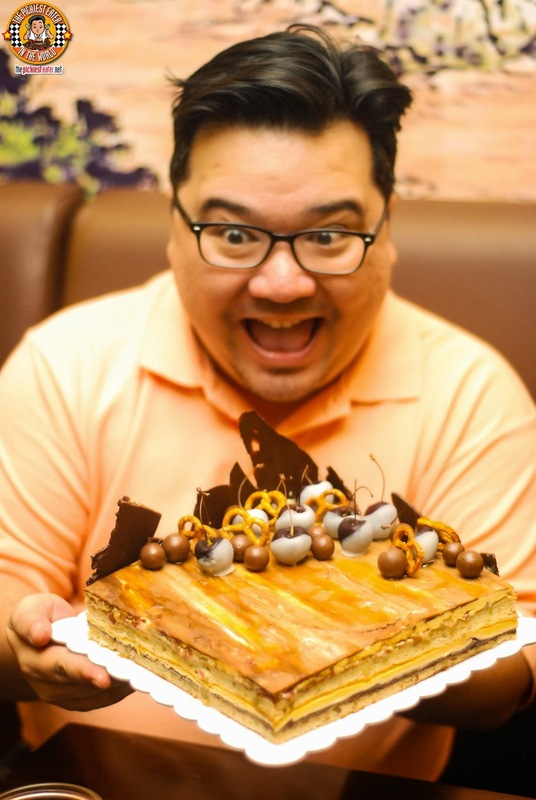 Miko is an award winning chef who honed his craft during his tenure at Raffles Hotel, and is now the Executive Pasty Chef of Magnum Manila, and the brains behind the latest cookie craze, "Scouts Honor Craft Cookie Shop". Chef Miko took on the challenge head on and let his creative juices run wild, to concoct a bacon infused cake unlike any other.. The result? 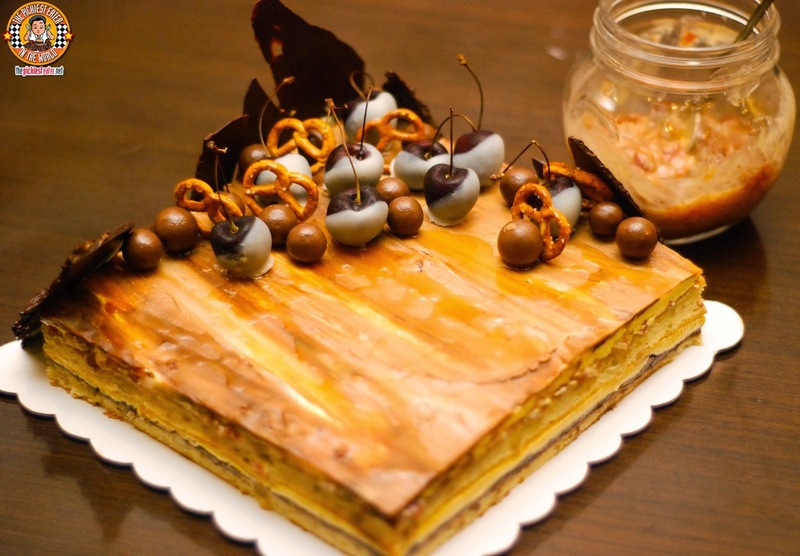 The Maple Bacon & Cherry Torte. Let me walk you through this work of art.. Even at first glance you can see that with the tones and hues, the frosting is reminiscent of streaky bacon. And it is the kind of cake that make you want to cry, especially if you're a bacon lover like me. 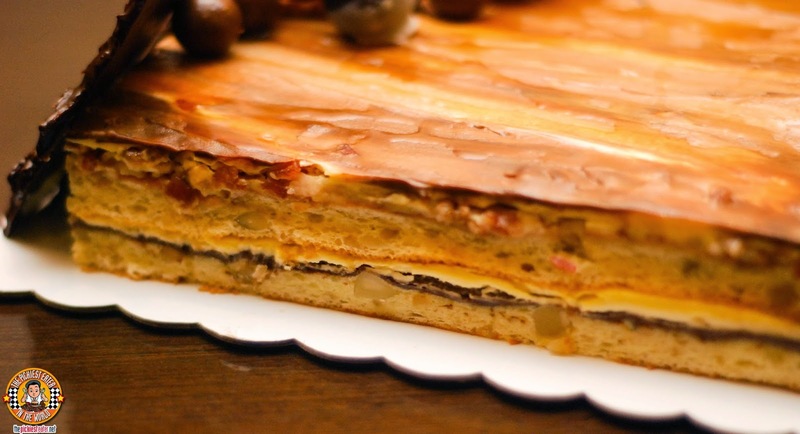 The Cake base is a macadamia joconde (sponge cake), and filled in between with a rich maple butter cream, with bits of bacon clearly visible in between the layers. The edges are lined with Nutella and Dark Chocolate Ganache shards peppered with bacon crisps. 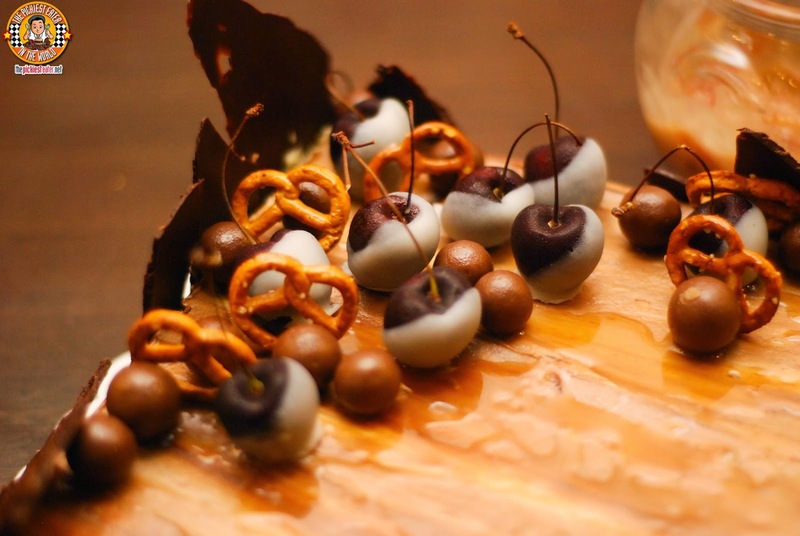 The cake is topped with Maltesers, mini pretzels, and Cherries dipped in.. wait for it... BACON FAT. 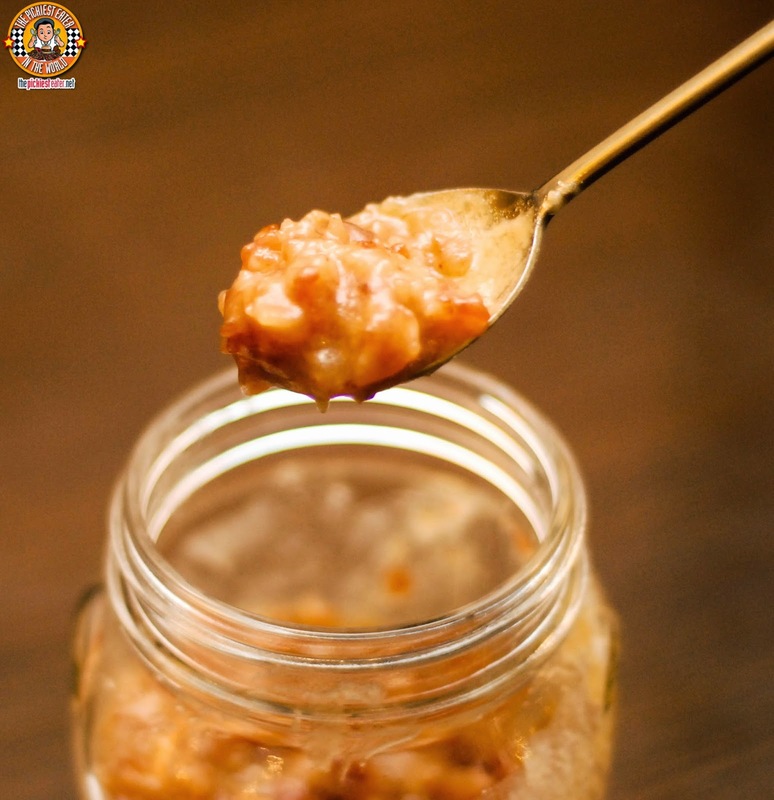 The dish is then finished off with a topping of Chef Miko's very own Bacon Jam, which adds another level of sweet meets savory deliciousness to the mix! What can I say? Don't I have the bestest friends? Thank you again to my blogger friends who took time out to join me on my special day, and made the effort to make it even more special. Like I told them, they didn't have to, but i'm sure glad that they did!!! There mere fact that my friends were thoughtful enough to ask a world class pastry chef to concoct a bacon themed cake for me, truly warmed my heart and made this for me, the BEST CAKE EVER. I could not thank them enough.. But let me try once again..
Special shoutout to The Hefty Foodie, Yedylicious, Blogalag, Chuckie Dreyfus, The Tummy Traveler, The Mommist, Ray and Lynne-En Route, Berto in Brogues for the wonderful birthday surprise! I'm really glad I got to spend my birthday with you guys! A special thank you to Chef Miko Aspiras as well.. You absolutely NAILED Hefty Foodie's challenge!! wow.. that cake is just so YOU! as in sumisigaw na ikaw yan. mr.bacon! :) Belated happy birthday! The whole time we were saying we wished you were there! That cake must be named the Richie cake since it's made with all your favorite ingredients with bits of bacon and bacon fat as the highlight. :P OMG I find myself tempted to have a tiny slice! It's really the best cake ever! Without a shadow of a doubt, it truly is!! Where can I get that Bacon Jam?! it was made by Chef Mikko Aspiras! BUSTIN' OUT OF THE BURGER JOINT! KICHITORA OF TOKYO: A RAMEN HOUSE ON THE RISE! MODERN SHANGHAI: A GRAND DINE-ASTY! BRASSERIE CICOU & THE KING CAKE!